To find out more about Ruth Whenham and her books, you can visit her website at www.whenham.com or her Facebook page www.facebook.com/RuthWhenhamBooks. She is always keen to hear from readers. 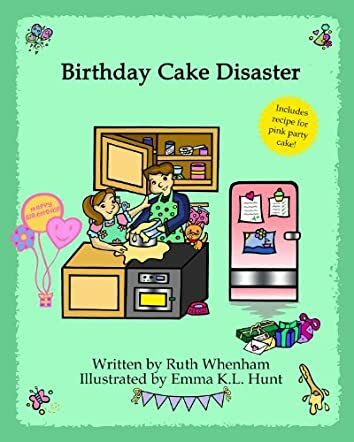 Birthday Cake Disaster by Ruth Whenham is a color illustrated rhyming story for children. It’s Mum’s birthday. Tess and her dad are making a special cake for her birthday tea. Dad claims to know exactly how to do this and the antics begin. Without a recipe to follow, he adds a host of ingredients and they mix, make a wonderful mess, and put the cake in the oven to bake. Tess isn’t so confident, and when a burning smell sends them running to the kitchen the results don’t look too good to her. But Gran is soon enlisted to help – or rather her mischievous hungry dog Dan saves the day. Dad’s feelings are spared and Mum gets a surprise birthday treat after all. Ruth Whenham uses rhyme to tell the story which is full of fun and humor as Tess and her dad put their baking skills into action. The characters are very likable and believable – I could just imagine Dad’s belief in his ability to make a cake and Tess’s concern but, at the same time, not wanting to upset him. We know there is a disaster waiting to happen, and we are kept in suspense as the plot carefully unfolds and eventually reaches a surprising and delightful ending. Sometimes, as in all families, it really can take Gran to sort things out. There is a lovely warmth to the story, and it portrays family love, togetherness and fun in an entertaining way. The cake recipe at the end of the book is a great idea, encouraging children and grown-ups to have a go together. Emma Hunt’s bright and cheerful illustrations complement the story perfectly, and really bring out the personalities of the characters and the humor in the story. I especially loved Tess’s imagined image of Gran coming to the rescue in “Supergran” costume! A warm and entertaining story to share with a child – a wonderful addition to any home or classroom library.